Nightshade-free Ropa Vieja!? This classic Cuban comfort food has been created without any inflammatory tomatoes or peppers but is anything but light on flavor! 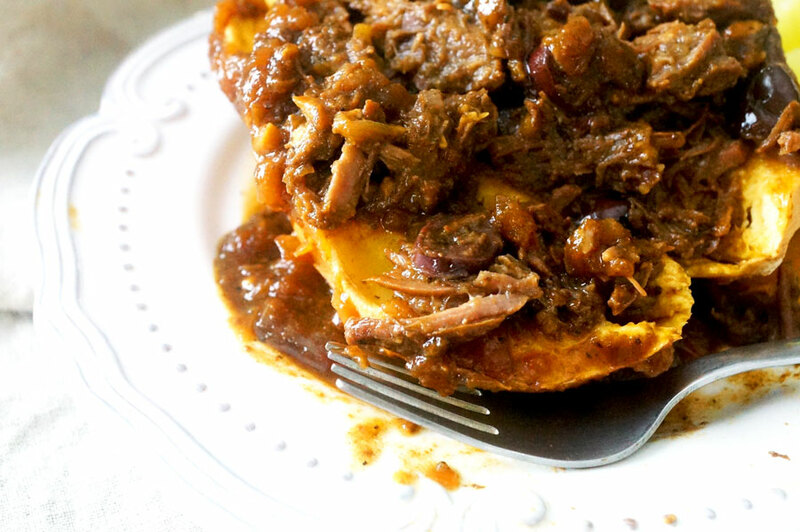 I’ve been dreaming of providing the AIP community with a true-to-Cuba version of Ropa Vieja. I’m so excited my experiment turned out favorably! Bonus: It’s made in the Instant Pot! If you’re not familiar with Ropa Vieja, it is one of the most delicious recipes of Cuban cuisine. Traditionally it is made with flank steak, lots of bell peppers, paprika, tomatoes and sometimes green olives and capers. The steak is braised in the juices of all those tasty veggies and broth. My version is quite the departure in terms of ingredients but not in flavor! How can I make Ropa Vieja without nightshades!? 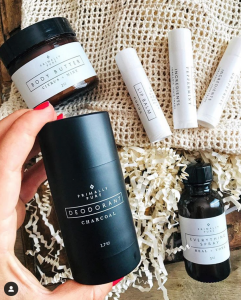 This AIP-friendly version comes close to the real thing – it’s pretty amazing! You’ll need two elimination phase introductions for this recipe: cumin and black pepper. The black pepper adds some spiciness without the nightshades & the cumin is a MUST! I’m sure it’ll still be tasty if you leave those things out, but I wouldn’t call it Ropa Vieja – maybe just tasty shredded beef and olives. Instead of flank steak, I use a more affordable cut of beef! 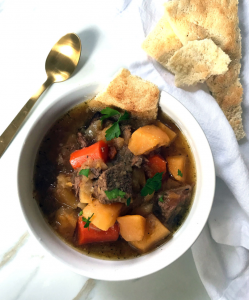 Stew beef – I can find grass-fed stew beef for only 3.99/lb at my grocery store Earth Fare. Flank steak isn’t always available and it’s usually upwards of $8/lb! I also use kalamata olives because I love the robust taste of kalamatas but you could use the traditional green olives here too. Now instead of using tomato sauce and tomatoes, all of this tasty goodness comes from simmering down the leftover juices from the beef, onions, fish sauce, coconut aminos and apple juice. You will be shocked at what an incredibly rich, savory and thick tomato-like sauce you will achieve with your Instant Pot! All of these ingredients come together to mimic the sweet umami flavor of tomato-based recipes. 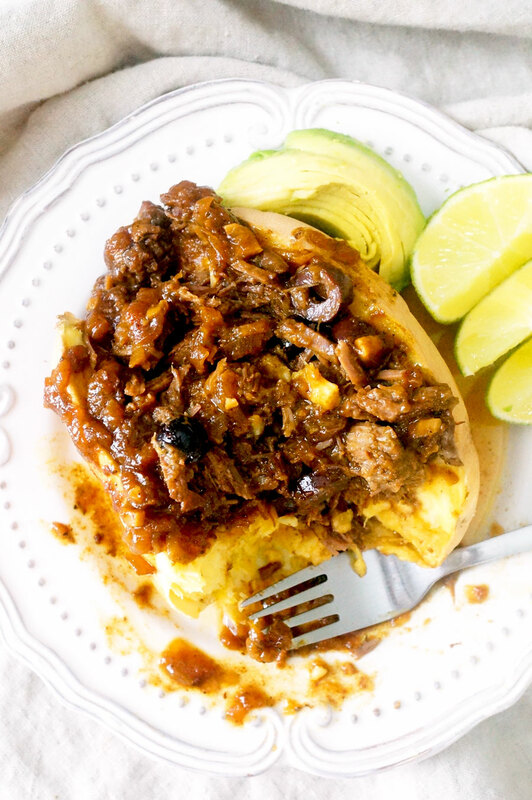 Lastly, I suggest serving this delicious Ropa Vieja over a baked white sweet potato or a bowl of cauliflower rice with avocado, extra lime juice and cilantro. This is such a slap-you-in-your-face flavorful dish, you really can’t go wrong! 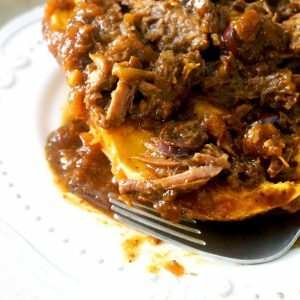 Making this recipe in a slow cooker? While I haven’t done that, here are my best suggestions! Perform the first ** steps cooking for 4 to 6 hours in your slow cooker. 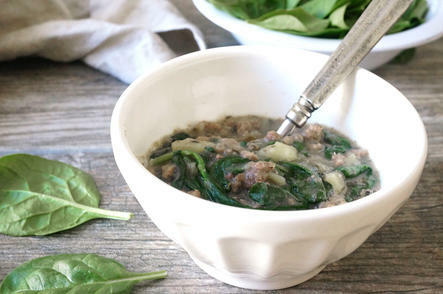 Remove the beef to a serving bowl and transfer the liquid, onions and bay leaf to a small saucepan on your stovetop. Simmer uncovered until condensed into a thick, rich sauce. 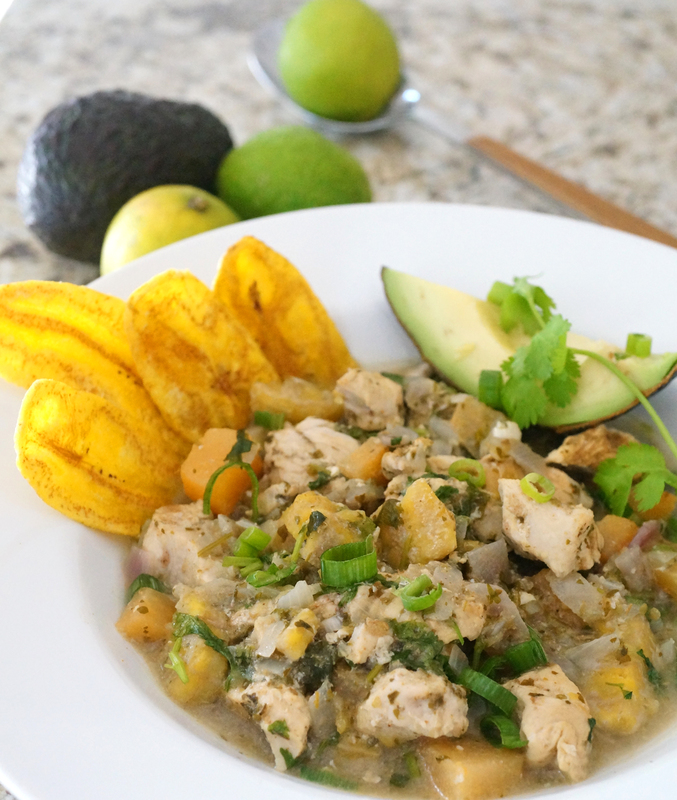 Looking for more Paleo-friendly Cuban dishes? 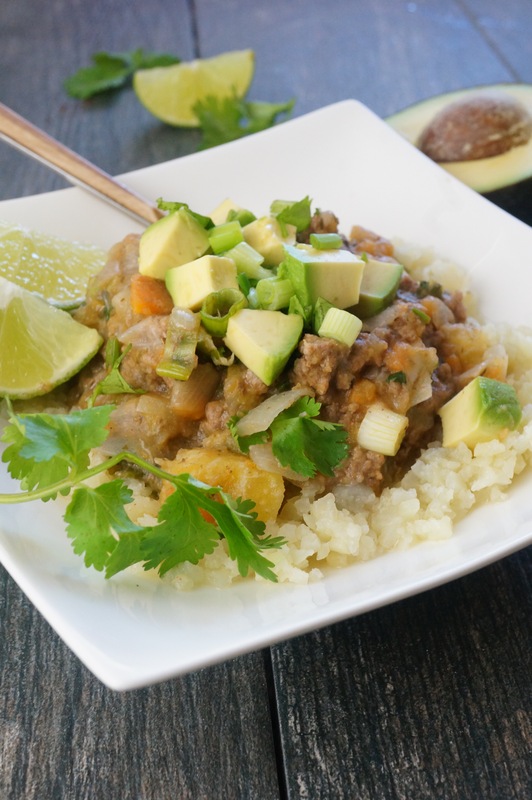 Try my Nightshade-Free Cuban Picadillo & Vaca Frita! Turn “Saute” function on your Instant Pot on Medium heat. Heat avocado oil. Saute onion for 5 minutes then add chopped garlic. Cook for another 2 minutes before stirring in the sea salt, cumin, pepper and turmeric. Cook the onions downs for 2 more minutes until slightly reduced. Add the beef, coconut aminos, apple juice and fish sauce. Set “Meat/Stew” function on to automatically pressure cook for 35 minutes. When timer elapses, transfer the beef to a large bowl, leaving the onions and liquid in the Instant Pot. Turn the "Saute" function back on and add the bay leaf to the pot. Allow liquid to simmer and condense to a thick sauce for the next 15 to 20 minutes keeping a close eye on it. The sauce should be thick like tomato sauce and dark red. Meanwhile, shred the beef with two forks and stir in the lime juice. When the sauce is ready, discard the bay leaf and stir sauce into the shredded beef. Mix in sliced olives and serve. You may use other cuts of beef here but you may need to adjust the cooking time. See blog post for slow cooker suggestions. If you haven’t picked up one of these ultra-handy modern day kitchen conveniences, you’re likely spending way too much time in the kitchen. 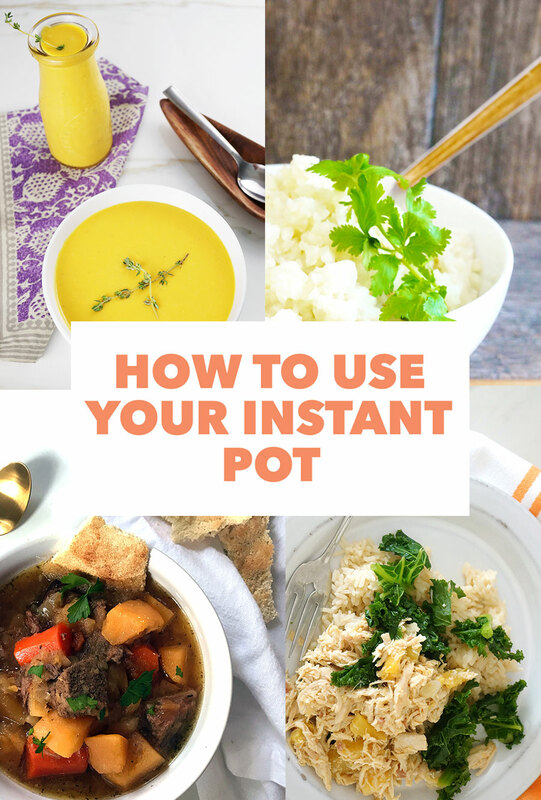 Here are my best tips for how to use your Instant Pot and the best model for you! I bought my first Instant Pot in 2013. I remember the day fondly…. a cloudy November in Chicago when all I wanted to do was cuddle up on the couch with my dog and a bowl of soup. Yet I had no broth nor a time machine to travel 24 to 48 hours prior to make broth in my slow cooker or *gasp* on my stovetop. But I finally had what I affectionately refer to as my Silver-Haired Boyfriend: the Instant Pot 6-in-1 6 quart pressure cooker. He came to to the rescue like a knight in shining stainless steel. One hour later I had soup. Ever since that fateful day, I have used my Instant Pot many times a week to speed up cooking, minimize prep and time standing over a stove. You know, so I can go out and enjoy life instead of being chained to the kitchen. In today’s post, I want to share with you some easy ways to combat any Instant Pot anxiety (it’s a thing). PS Your Instant Pot will not explode. It is created with many safety features… just read your manual for additional safety tips for your model! I now own the Lamborghini of pressure cookers… the Instant Pot Ultra Multi-Use Programmable Pressure Cooker listed below. All models prepare your food up to 70% faster than using traditional cooking methods! MY MOTTO: INSTANT POT SAVES LIVES. I NEED TO MAKE THAT INTO AN INSPIRATIONAL SCRIPT-Y QUOTE ON MY BEDROOM WALL. Instant Pot 6-in-1 6 quart: This base model Instant Pot really does everything you NEED it to do… unless you want to make homemade yogurt. Which I still haven’t done. It has a Pressure Cooker, Slow Cooker, Rice Cooker, Sauté, Steamer, and Warmer function. It is easy to use, easy to clean, and pretty much dummy proof. PROS: It’s the cheapest of the line! It does all your basic pressure cooker functions listed above! FOOL-PROOF! CONS: The 6-quart model is fairly small…. enough to hold a rack of ribs or a 3 pound whole chicken. If you want to fit a 5 pound pork roast though, you’ll have to cut it into smaller chunks. 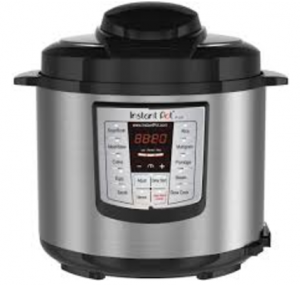 Instant Pot 7-in-1 8 quart: This is the model up from the above 6-in-1. The 7-in-1 has the added feature of being able to make yogurt. It also is two quarts larger which is helpful for making larger batches of broth or larger roasts. PROS: Larger pot size for bigger roasts, broths, chickens or soup bones. Yogurt function included. CONS: It’s about $50 more expensive than the 6-in-1 with not a ton more functionality. I would recommend skipping this model unless you really want the extra space, and choosing either the base 6-in-1 or the Ultra 10-in-1 below! Instant Pot Ultra Programmable 10-in-1 6 quart: This uber high-tech machine has a Delay button so you can program it to start pressure cooking up to 24 hours in advance. The Warming function keeps food warm for up to 10 hours! It also has a turn dial knob to quickly switch between functions. It has the most amount of functionality including: Soup/Broth, Meat/Stew, Cake, Egg, Sauté, Rice, Multigrain, Porridge, and Slow Cook. PROS: More functionality and much greater control of cooking temperatures and time. The Slow Cook & Saute functions have 3 levels (low, medium and high heat). Better for high altitude cooking (adjust for altitude). Great for on-the-go families – set it to start cooking while you’re at work or a soccer game! You can make yogurt in this one too. CONS: This one is a bit less intuitive to use. You really need to read the manual to figure out how to properly set your functions. Once you get the hang of it, it’s a breeze though! Broth is one of the easiest recipes to make in your Instant Pot. Start with at least 2 pounds of pastured beef, chicken or pork bones. To get the most gelatinous broth, choose chicken feet. To get the most flavorful broth, make sure you add carrots, onions, garlic, sea salt, and a bay leaf to your pot. Add all ingredients to Instant Pot. Set “Manual” function to at least 60 minutes (the more, the better flavor). Once timer has elapsed, set the “Saute” function for 30 minutes. Keep the lid off and let your broth simmer to reduce slightly and condense the flavor into a stock. At this point, you can add fresh herbs, lemon juice, or dried herbs. Keep a close eye on the liquid level to make sure it does not reduce too quickly (the full 30 minutes may not be necessary depending on liquid amount). You do not want to over-cook your cauliflower rice. It is best to set for no longer than 2 minutes or you risk winding up with a watered down mush. 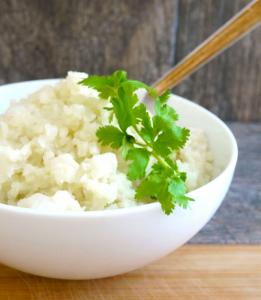 Use my recipe for Creamy Cauliflower Rice as a start. Soak uncooked rice by covering it with filtered water for 30 minutes in the pot. Discard all water and rinse rice again. Add an equal amount of liquid to the pot. For example, if you used 1 cup dry rice, use 1 cup liquid of choice (water, broth, coconut milk). Add 1 teaspoon oil for every 1 cup of rice as well as a generous pinch of salt. Cook using the “Rice” function on your Instant Pot model and release pressure as soon as the timer elapses to prevent over-cooking the rice. Stir immediately to prevent sticking. My basic formula for making quick stews and soups is below. Note that you do not want to always add the vegetables at the same time as the meat. To get perfectly cooked components, you add them at separate times just like you would on the stovetop. The nice part is you don’t have to stand over the stove to watch for burning or over-cooking when using the Instant Pot. My 1-hour Pot Roast is a good example of this technique. Turn “Saute” function on. Saute beef until lightly browned (2 to 3 minutes) then add onion and garlic and sautee for another 2 minutes until fragrant. Set “Manual” pressure cooker timer to 25 minutes. NOW you add the starchy veggies to prevent overcooking them with the meat (which needs a longer cooking time). Cook meat & starchy veggies for about 7 or 8 minutes on “Manual” function. Release pressure, place on “Saute” function and stir in hearty greens until wilted and tender. When first introducing solids to my baby, I used the Instant Pot for a lot of her food. The first reason being it’s all I had time for…. secondly I didn’t have to stand over the steamer basket poking sweet potatoes obsessively to see if they were done. Depending on size of sweet potato, cook for about 10 minutes on “Manual” setting. Release pressure when timer elapses, poke with a fork for doneness. You can always add a couple more minutes if you think your large sweet potato needs longer. Remove sweet potatoes to a cutting board, slice open and let cool. Mash with fat of choice until smooth. You can even use the cooked sweet potato make my Sweet Potato Fat Balls which are easy for babies to self-feed and pick up! I have not made yogurt in my Instant Pot yet but thankfully by friend Laura has so check out her recipe! Coconut yogurt provides baby with real food probiotics, is easy to digest and full of healthy fats! Unseasoned stewed meats are an excellent first food for babies! You can make the stew recipe above but keep any spicy spices out of it to be safe! Remove the meat and starchy veggies from your stew, let cool, and shred, mash or puree for your baby depending on their age and abilities. I also suggest making Broth of Stock out of marrow bones but first roasting the bones, scooping out half the marrow and reserving it for baby, and then making your family’s stew with the remaining bones and marrow! 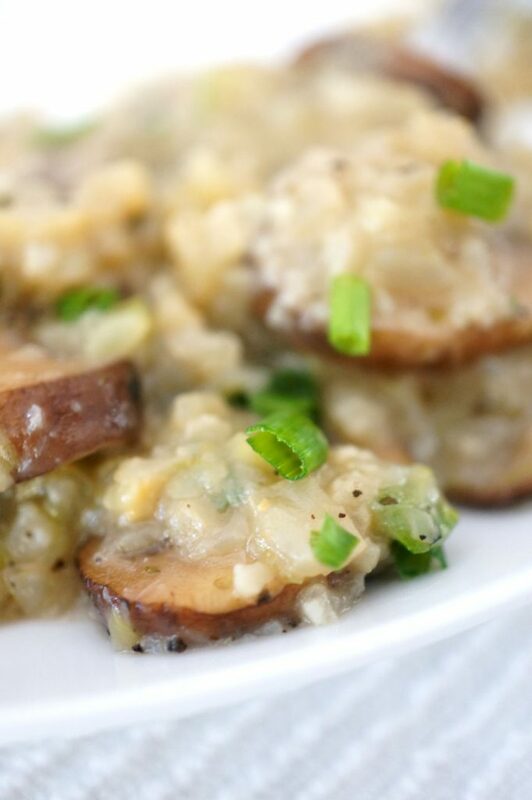 Dairy-free Risotto made in your Instant Pot = the most hands-off risotto recipe you’ve ever tried! Is there a sexier food word than risotto? Maybe creme fraiche (really drawing out the shhhhh at the end). Has anyone seen that South Park episode? I’m not even going to go there. I have only made true brothy, buttery, cheesy risotto one time in my life. It was when I was 18 and I remember standing in my mom’s kitchen, stirring a pot of arborio rice for 45 minutes and periodically scooping broth into the pot and allowing it to absorb into the rice. It was magical how creamy it got! But it was also very labor intensive + I can’t say any food is worth an achy shoulder and wrist. 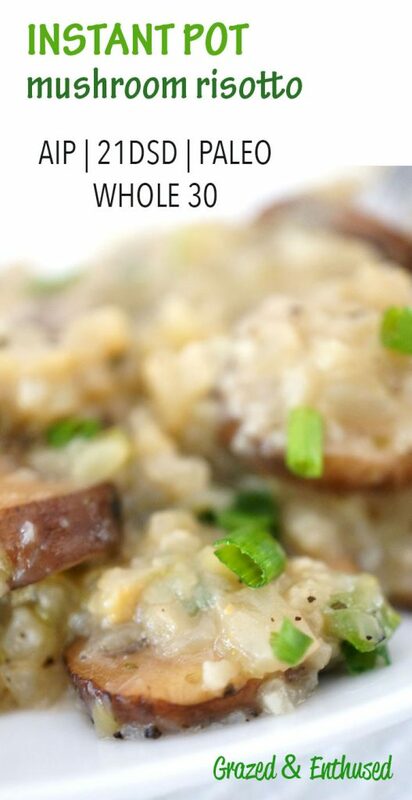 While I do eat white rice, I wanted to create a lower carb AIP risotto that can be enjoyed by all of you without the dairy or grains. The finished product is thick, creamy, flavorful, and made up almost entirely of vegetables! You can serve it as a meatless meal or serve some thinly sliced seared pork loin, cod, or shrimp on top. Pre-riced and bagged cauliflower is ideal for this recipe because you are ensured even sized pieces. I find that some people over-process cauliflower when they rice it at home in their food processor. With pressure cooking every minute counts when you’re cooking vegetables, so ensure whatever cauliflower rice you use it is not overly-processed mush! 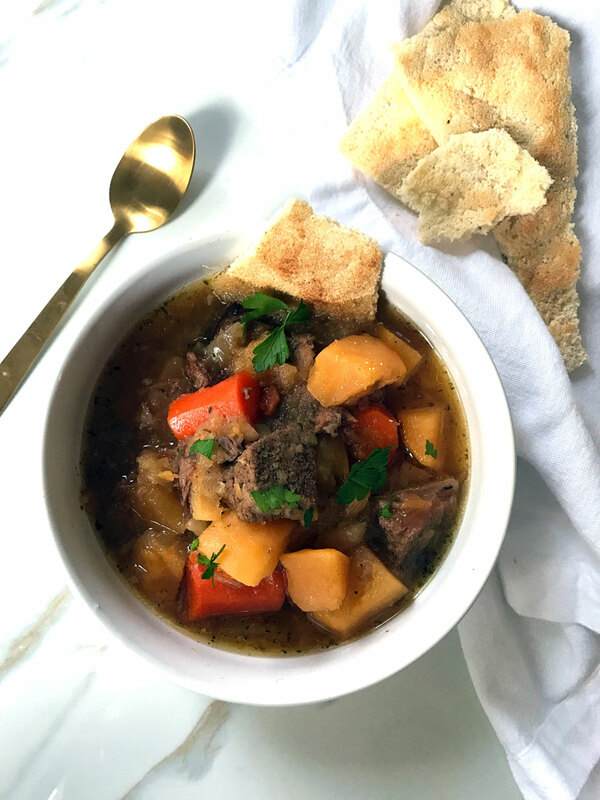 I’ve never made this on a stove – it’s an Instant Pot recipe. Please don’t ask me how to do this! 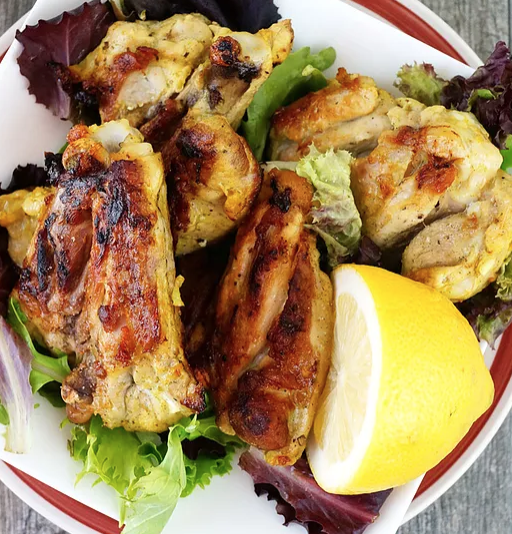 There’s a reason I’m posting a lot of Instant Pot recipes these days – they save you the hassle of standing over the stove constantly checking on food or worrying if it’s undercooked. Don’t have Italian herb seasoning? Make your own custom mix from dried basil, oregano, marjoram, and thyme. Turn Instant Pot "Saute" function on. Heat olive oil in the insert. Saute mushrooms, leeks, zucchini, herbs, garlic, and sea salt for 6 to 8 minutes or until the vegetables are tender. Stir in coconut milk, broth, and cauliflower rice. Seal the lid and set to "Manual" function for 3 minutes. Once the timer elapses, vent and remove the lid. Turn the "Saute" function back on and slowly sprinkle in the arrowroot, stirring continuously, as the mixture thickens for another 2 to 3 minutes. You can always sprinkle in additional arrowroot a teaspoon at a time if you find you want even thicker, creamier risotto. Serve with chopped chives and black pepper for a punch of flavor! My Instant Pot rescued me AGAIN last night. I made some last minute plans and had 45 minutes to prep and serve dinner before I had to leave. I wanted to do a take on my Hawaiian Pork from The Healing Kitchen using the organic chicken breast I had on hand. I’ve been craving and eating tons of pineapple lately, so I always have that in my fridge too, which reminded me of the pork recipe. I like this version even better. It’s lighter and easier to digest since it’s lower in fat than pulled pork and very filling. I served it with fried plantains and steamed kale. Best way to steam kale? After cleaning out your Instant Pot, add a couple bunches of chopped curly kale into your Instant Pot and set to cook on Manual for 1 minute! Totally hands off + an easy nutritious side dish. No excuses to not have any greens on your plate! I also serve it over rice made in the Instant Pot when I need some extra carbs that day! The most nutritious way to make rice? Soak it in water and apple cider vinegar (1 tsp) for 12 to 24 hours then cook in bone broth using the Rice Setting on your machine! Season with mineral-rich sea salt for the healthiest rice on the planet! 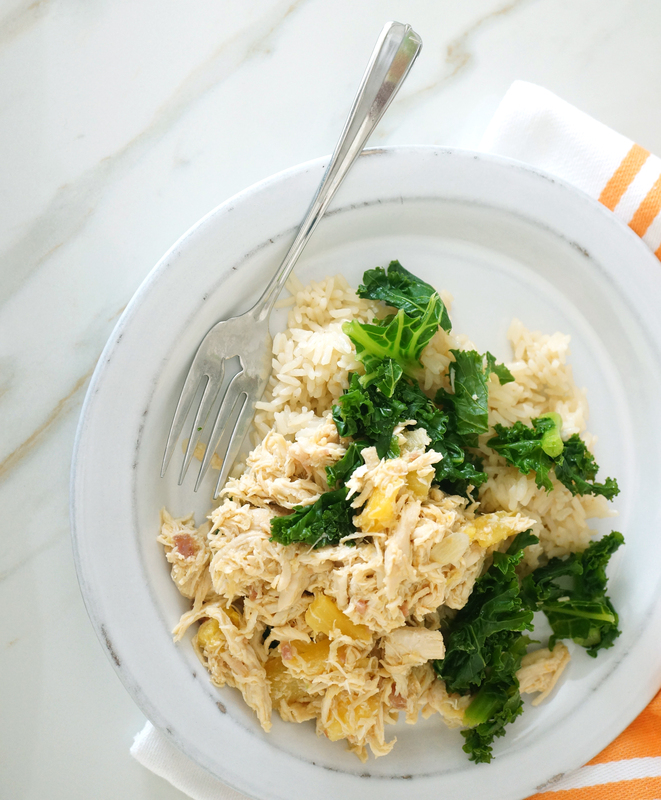 Instant Pot Pineapple Chicken is the perfect tropics-inspired combo of salty, sweet and smokey + the recipe is affordable and makes a ton for leftovers! Family and kid-friendly for sure! 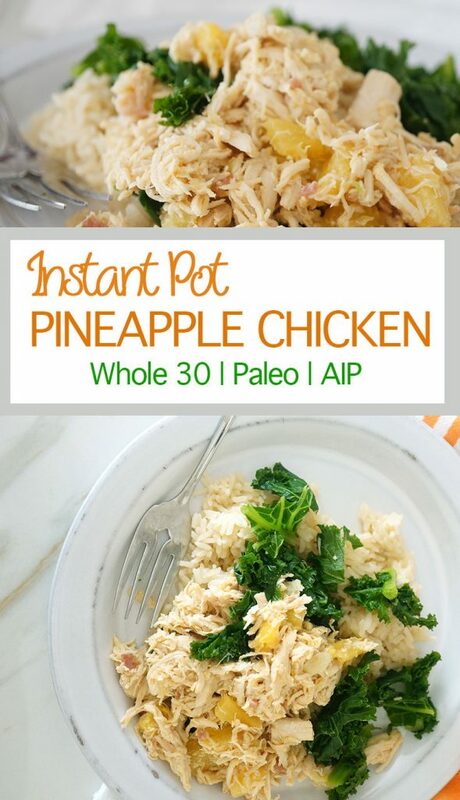 Place chicken in Instant Pot insert. Sprinkle with sea salt and layer bacon on top. Add in pineapple, onion, aminos, fish sauce and galangal or ginger. Seal the lid and set "Manua"l pressure cooking timer to 25 minutes. Once timer elapses, release pressure valve and open the lid. Carefully transfer contents of pot with a slotted spoon, leaving the liquid in the pot, to a large glass bowl. Turn the Instant Pot “Saute” function on. Add the garlic and remaining 1 ½ teaspoons fish sauce to the cooking liquid. Allow the sauce to simmer for 10 to 15 minutes, reduce slightly, and turn a golden yellow. Meanwhile, shred the chicken with the pineapple, onions and bacon with two forks until finely shredded. Pour the reduced sauce from the pot over the shredded chicken and stir well to immerse the meat. Serve warm with cauliflower rice, steamed kale, and fried plantains. This chili is pretty much a 1-step recipe. Throw everything in your Instant Pot and out pops the most delicious chicken chili recipe that has all the familiar flavors of Mexican chili without any of the nightshade peppers or seasonings. I got the idea for this chili from Sweet Potatoes & Social Change’s recipe for White Chicken Chili in The Paleo AIP Instant Pot Cookbook. 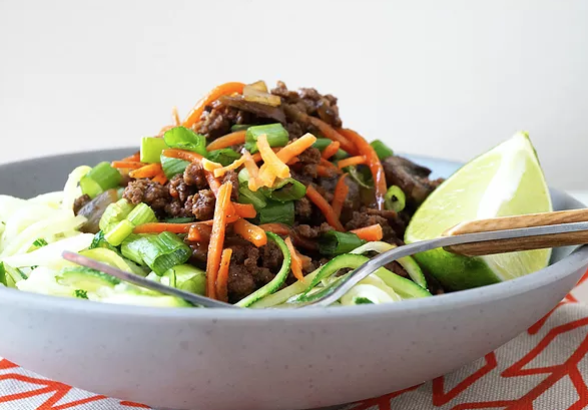 This version adds some extra veggies, herbs and seasonings (omit the cumin for AIP, but most people tolerate seed spices well after the elimination phase) as well as some perfectly paired toppings like avocado, green onion and cilantro. PREP TIP: Always make sure you cube your vegetables and protein to the sizes listed below to ensure properly cooked food when using your pressure cooker. If you don’t know what half an inch looks like, break out your 3rd grade ruler like I do. Mine is a unicorn and rainbow holograph ruler, and I will never throw it away. It has moved to almost a dozen homes with me in the last two decades. This was our second weekend in our new home. We are still getting everything settled and I’ve almost set up Grace’s room. This is her first bedroom and will be so until she’s at least 5 years old, so I wanted to make it look how I would want my bedroom to look if I was a toddler. There’s a teepee, a feathered ottoman, sparkly golden orbs hanging from the ceiling, shiny gold polka dots on the walls, and a bean bag reading chair that fits both of us. I may also hang a Paul Walker poster in there. For her obviously, not for me. The thing I’m most excited about is our new Sunday evening tradition: family beach walk. Last night’s walk was extra peaceful because it was drizzling and cloudy, so most people were home and we had the beach mostly to ourselves. We walked to a sand castle carving contest and a drum circle and darted into the car just before it stormed. I can’t be away from the ocean. It makes me feel like I’m on the edge of the earth and reminds how small and insignificant I am. Not in a way that puts me down but a humbling reminder that I need to take care of my tiny little piece of this world as best I can. Over the last couple years, I’ve forged relationships with people who I thought were good people only to discover they are out for themselves. It was heartbreaking because it’s important for me to be a loyal and dedicated friend and to never turn my back on a person, no matter how far they live from me or how often I see them. Dipping my toes into the ocean and listening to the rhythmic lapping of the waves is a welcome and gentle reminder that those situations are no definition of our world. And people who are not so nice to you probably don’t get out in nature near enough! Right? Because how could you possibly be anything but optimistic and kind if you leave near the ocean or forest or mountains? This world was built to be a beautiful place made for beautiful moments, yes? In your Instant Pot insert, combine all ingredients except the chopped cilantro. Seal the lid and set the “Manual” timer for 9 minutes. Once timer elapses, manually vent the lid. Stir in the cilantro. Serve in individual bowls with suggested toppings. You may use pork loin in place of the chicken, if desired. You guys love your healthy, low-sugar treats just like I do! I never want you to miss out on a holiday, or old favorite recipe. 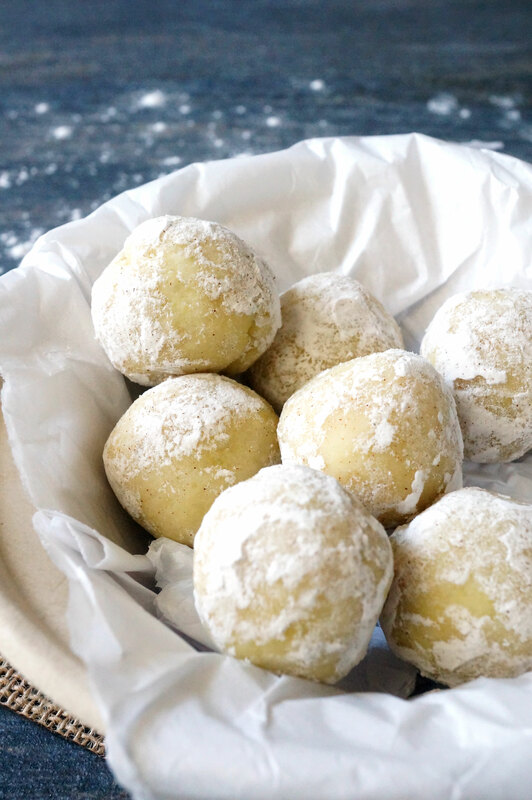 These “Snowball” cookies aren’t the same texture as your old butter and sugar laden favorite, but they are super delicious, nutritious and leave out the dairy and most of the sugar. These were the #1 hit on my site in 2016 and I only released them in October – that’s a lotta cookie love! 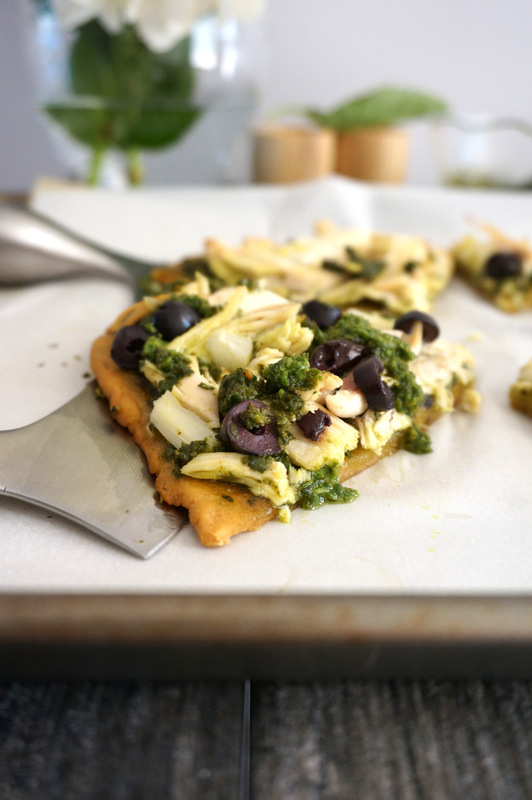 Probably one of my favorite AIP recipes I’ve ever created – you will NOT feel like you’re missing gluten, dairy, and nightshades with this flavor-packed grain-free, dairy-free pizza. It’s the shiz. So much tasty, savoryness. I make it for larger gatherings and cut it into small squares for easy finger food. Add it to your holiday appetizer menu & serve it to non-Paleo folks. I promise they will love it too! This was a surprising favorite among the Internet folks! This easy main dish has a ton of flavor – you definitely won’t feel like you’re missing out. Even better if you grill it! My husband said this is his favorite chicken dish I’ve ever made! Andddd… not surprising. 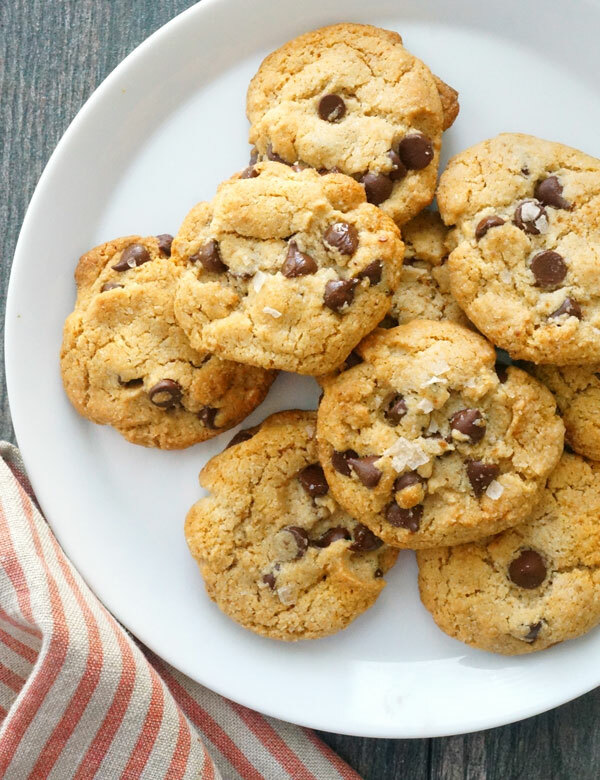 Who doesn’t love a classic chocolate chip cookie? While my original recipe is not AIP because it contains almonds and dark chocolate! 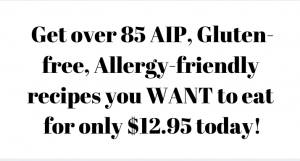 You can sub tigernut flour in place of the almond flour for AIP! 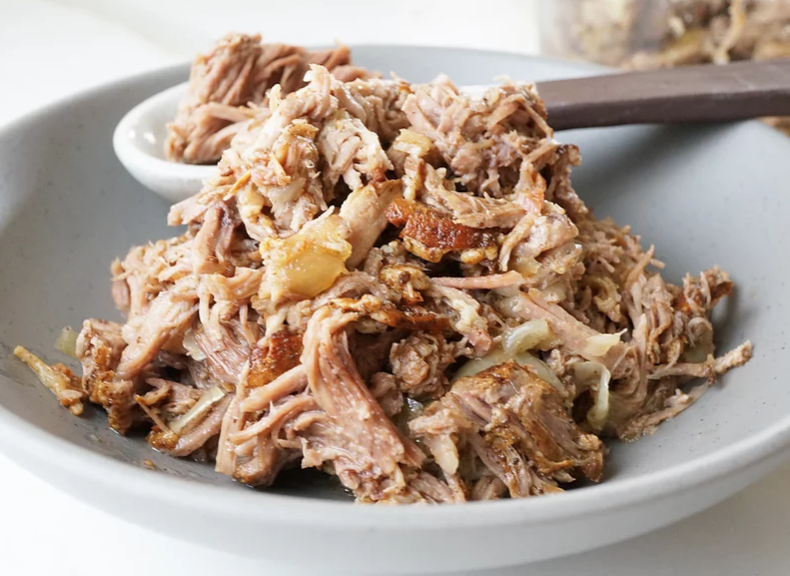 Yeah, you should buy an Instant Pot just so you can make this pork. And the Mojo Pulled Chicken from The Healing Kitchen. 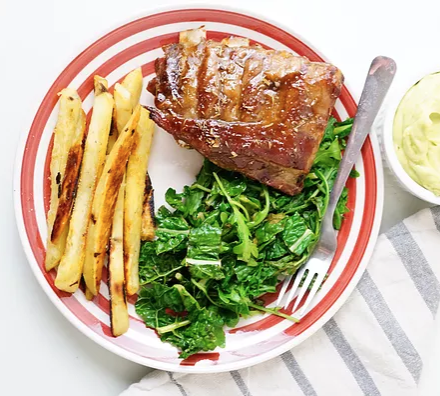 This pork is addicting – sweet, savory, salty, bacon-y. I mean pork on top of pork with sweet maple syrup and tangy balsamic vinegar? Duh. Serve it with braised greens and some roasted veggies for an easy weeknight meal. 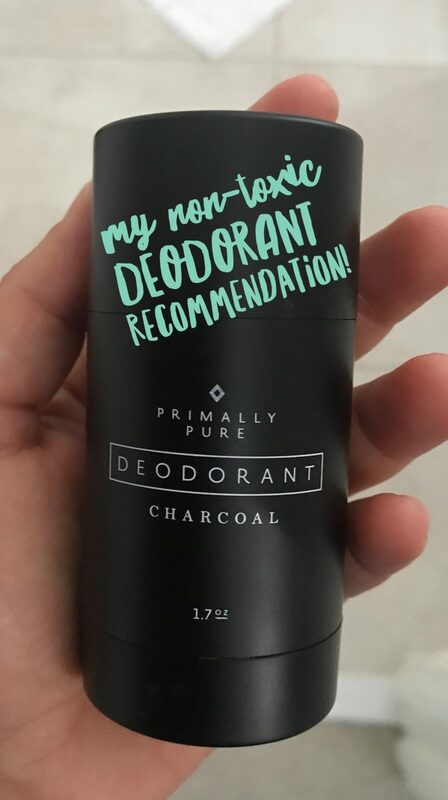 Another no-brainer that made the list! 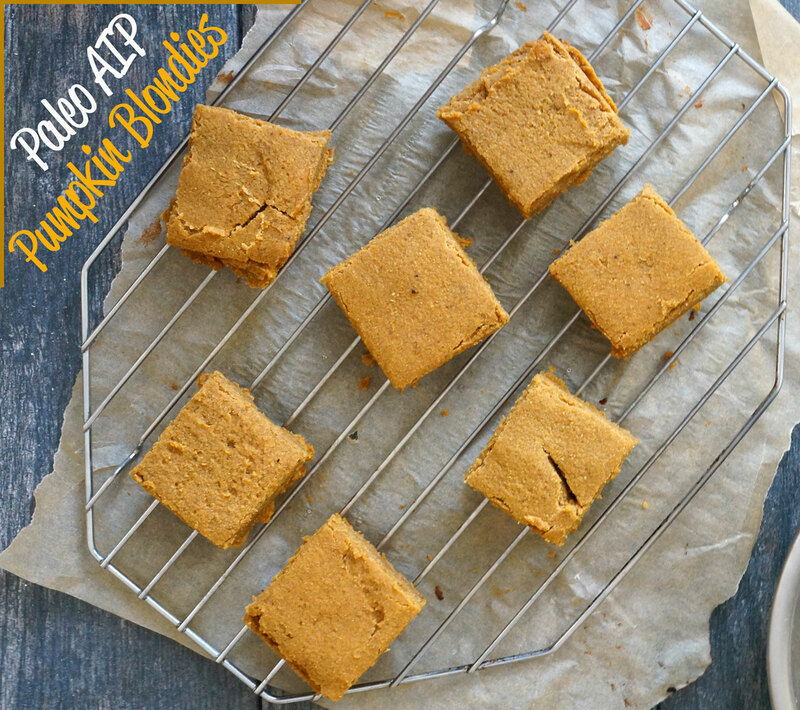 These blondies are dense, moist, cakey and contain all the fall feels we know and love. Top them with creamed maple syrup, also called maple butter, for a decadent treat this holiday season. 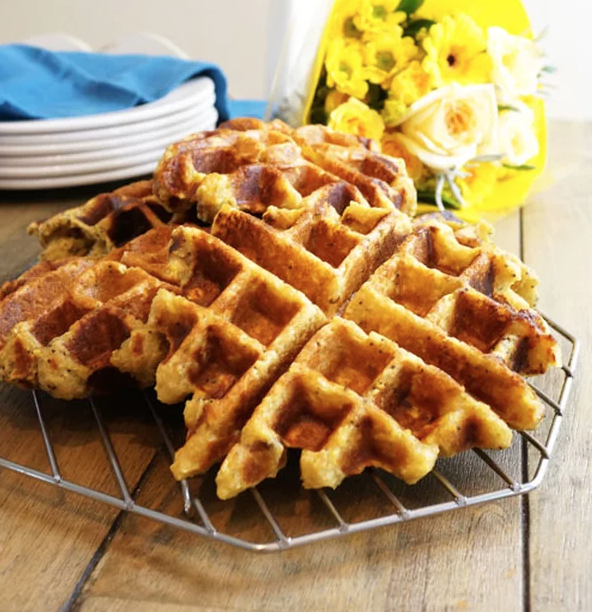 You’ll want to leave out the poppyseeds to make these 100% AIP, but I included them in the list because these plantain-based waffles are foolproof and delicious. They are thick, sturdy, bread-y, and customizable! Serve them with cooked fruit instead of maple syrup for a completely sweetener-free but oh-so-sweet breakfast treat! Need a Xmas morning breakfast? We always make grain-free waffles and serve a “waffle bar” with bits like bacon crumbles, coconut whipped cream, and honey. Om-nom-nom. Can’t beat this protein & veggie packed bowl of tasty Asian-inspired goodness. It makes a beautiful presentation too, so whip this up for your sweetie, and enjoy date night in this week. THE BEST SOUP. I can’t stop making this one! It’s SO creamy, satisfying, just perfect happy food. If you have reintroduced white potatoes (a nightshade), use them in this soup instead. 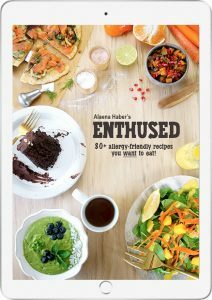 I also want to experiment with celery root or parsnips! This is my #1 pick for the year, even if it only made the #10 spot. I made this every Wednesday night during my 3rd trimester of pregnancy, served with a green salad and some other veggies. It’s really dang incredible how you can achieve fall off the bone, delicious sticky ribs with practically no effort with the Instant Pot! Nightshade-Free Instant Pot Chili + 3 Tips for Instant Pot Recipes! I mentioned last week it’s a good idea to follow me on Instagram, in case I ever post any of my meals and you want the recipe. Here’s another example from that! I made this Nightshade-Free Chili in the Instant Pot for my mom this weekend, and we both loved it so much. It took me under 20 minutes to prep, and then I let the Instant Pot do all the magic.It’s one of the last remaining appliances in my kitchen besides my coffee grinder and blender before our move. So you know how you can take those stress surveys at the end of the year at work that rank how stressful your year was? I am in the tippie-top category this year. And I’m feeling it. It seems like I’ve been going through one major life change to the next, and I’m so ready for things to stop changing so dramatically. It’s hard enough being a first time mom, but we’ve both had changes in employment multiple times this year, bought a home, went through an autoimmune flare, birthed a baby, raised said baby away from family support, and are moving to another state during the holiday season. Too much for me to handle personally! Another reason why I can’t get enough of my pressure cooker and why I cook almost all our meals in it. Somethings gotta give, and that’s standing over the stove and oven when I have 4 billion other things that have to get done. I’ve heard from a lot of you how you’re scared to experiment with your Instant Pot on your own. So I divided up the ingredients to the recipe into 4 categories. SAUTE FUNCTION: You want to start with your vegetables to par-cook them a bit with or without oil in the Instant Pot insert using the Saute function. This isn’t necessary all the time, but by par-cooking them, it means you won’t have to pressure cook them for as long, which means you won’t overcook everything else that goes into the pot for pressure cooking! SEASONING: Then you want to add your dried seasonings, herbs and salt, along with your protein. I prefer ground meats and seafood for my Instant Pot soups/stews because they cook MUCH more quickly than stew meat, and then you won’t overcook your veggies inadvertently. FINISHING TOUCHES: Once your dish is finished pressure cooking, it’s always a good idea to add Finishing Touches to brighten the dish and add extra flavor. Here we use lime juice, cilanto, green onions, avocado, fish sauce, and cocoa powder. If you’re wondering what cocoa powder, fish sauce, and coffee are doing in your chili, you are not alone. I had a few people wonder the same thing when I posted the ingredients on Instagram. They are added in small amounts to add depth of flavor since we are missing the nightshades. That’s why it’s also important to add all those yummy fresh toppings to your bowl of chili! This nightshade-free chili is 100% a crowd pleaser, super filling + loaded with fiber-rich veggies and gut-healing broth! Turn Instant Pot “Saute” function on. Sweat onion, plantain, turnip and sweet potato with the oregano, thyme, sea salt, garlic andcumin for 4 to 5 minutes until slightly softened, stirring frequently. Add cold brew, broth and pumpkin to the insert and stir. Crumble in ground beef with your hands. Seal lid and set “Manual” timer for 5 minutes. Once timer elapses, immediately vent the pressure. 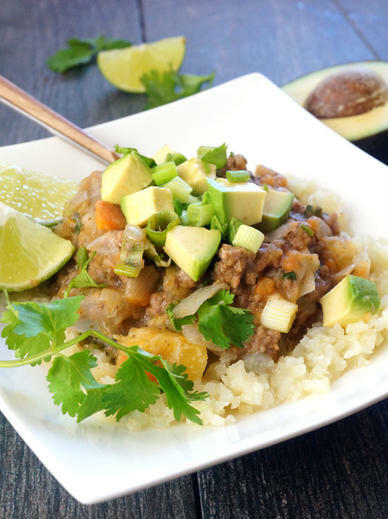 Stir in the lime, cilantro, green onions, fish sauce, and cocoa and top with avocado. Serve warm. Holy schnitzel, it’s been quite the week over here. My husband got an awesome job offer in Florida, so we are packing up our baby & things, and moving in just a few weeks!! Literally will be spending Thanksgiving surrounded by boxes, not food, this year. Good thing Grace isn’t old enough to realize that’s a crummy way to spend a food holiday. 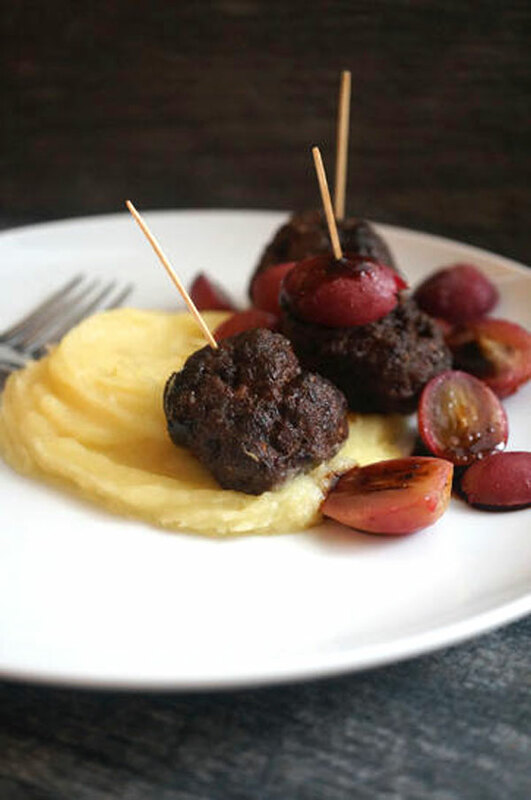 These Greek meatballs are beyond delicious + when paired with roasted grapes and the creamiest parsnip puree – HUBBA, HUBBA! In a food processor, pulse pitted olives until pureed. Add lamb, coconut flour and oregano to the processor and pulse until well combined. Form 16 golf ball-sized meatballs. Place on baking sheet. Add halved grapes to the same baking sheet and sprinkle with the pinch of sea salt. Bake for 18 minutes for well-done meatballs. If you would prefer medium-done meatballs, bake for 14 minutes but continue to roast the grapes for the full 18 minutes. Meanwhile, place parsnips, broth and salt in Instant Pot. Seal the lid and set Manual Timer to 7 minutes. Once timer elapses, vent the lid. The parsnips should be cooked and have absorbed the broth. Transfer parsnips to a blender and puree. 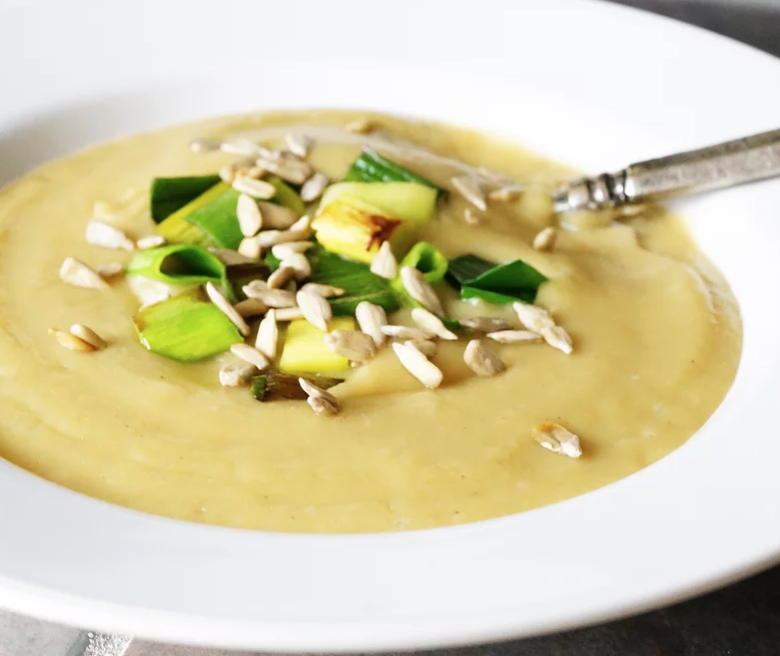 Add just 1 tablespoon additional broth if the blender needs help getting going for the creamiest puree. 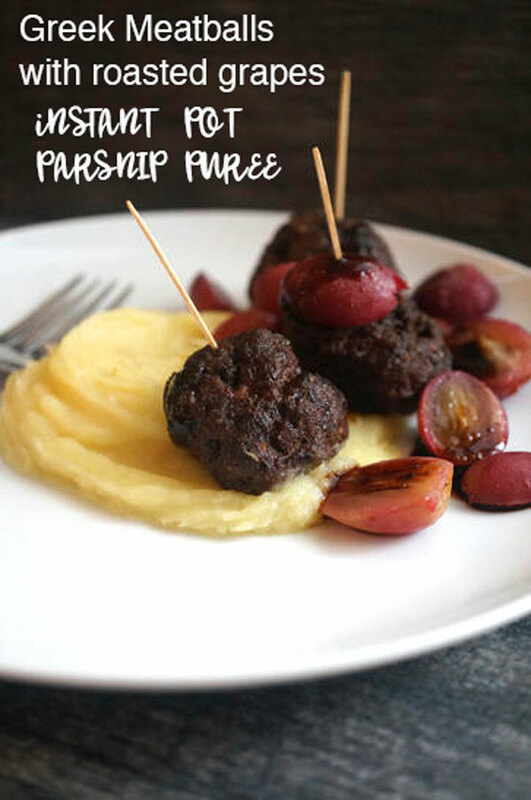 Serve meatballs atop parsnip puree with roasted grapes. A drizzle of balsamic reduction is delicious on this meal! The Instant Pot obsession continues, but how could it not? 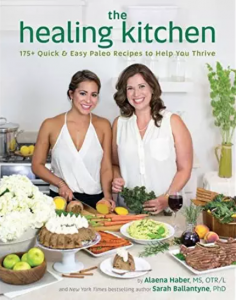 I’ve never spent less time in the kitchen since going Paleo/AIP (especially AIP) since incorporating the Instant Pot into my daily meals. My leftovers taste great, even better, and every meal I make is a winner with my husband. I’ve been saving a lot on groceries too by using this wonder-appliance for most of my meals. So that’s a win-win-win, but who’s keeping track? Me. It’s pure time-crunch glory. 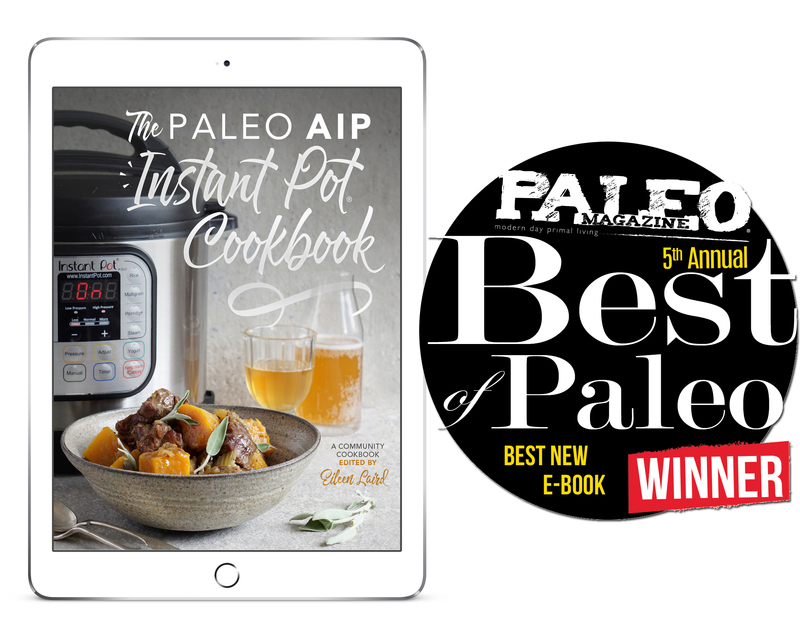 Last week’s release of The Paleo AIP Instant Pot Cookbook got me all riled up for soup season. I am a previous “non-soup-person” – I just never preferred it to salads. But now that I see how much goodness I can get into one economical bowl of delish-ness, it’s an easy choice to make. Recently, most of my meals have been soups, so today I’m sharing a quick and easy favorite that is easy to adapt to whatever herbs/spices you have on hand. Feel free to use lamb or bison in place of the beef. Lamb would be particularly delish with the rosemary here! You can use any white sweet potato, but I prefer the Japanese yam since it’s the starchiest. The broth gets absorbed into the yam during pressure cooking and it’s amazing. Of course you can use regular white potatoes here if you eat those. And you can swap out the spinach for power greens, chard, kale, really any leafy greens, but spinach wilts the easiest. Creamy Ground Beef & Potato Stew is budget-friendly, comforting & healing! Turn Instant Pot “Saute” function on. Heat olive oil in insert. Add shallots and ½ teaspoon sea salt to insert and cook for a few minutes until fragrant and lightly golden. Add ground beef, rosemary, thyme and remaining ½ teaspoon sea salt to insert and cook for 2 to 3 minutes to lightly brown the beef. Stir in bay leaf , cubed yam, and bone broth and seal the lid. Turn “Saute” function off and set Manual timer to pressure-cook for 8 minutes. When timer elapses, immediately vent the pressure. Remove the lid and sprinkle in the arrowroot starch while stirring the stew to thicken it. Stir in the spinach in batches of handfuls until wilted. Stir in cinnamon and cloves. Ladle stew into bowls and serve warm.